A Shropshire care home has opened a shop in its grounds to help residents with dementia retain their independence and take part in normal daily tasks. People with dementia who live at Lightmoor View in Telford will be able to go shopping in the new facility that has been set up in a summerhouse in the grounds. It will stock every day essentials, newspapers and sweets. The money for the shop, which is based in a summerhouse in the gardens at Lightmoor View, was raised by staff who spent the night sleeping outside to collect donations for the £2,000 required to buy the summerhouse last year. 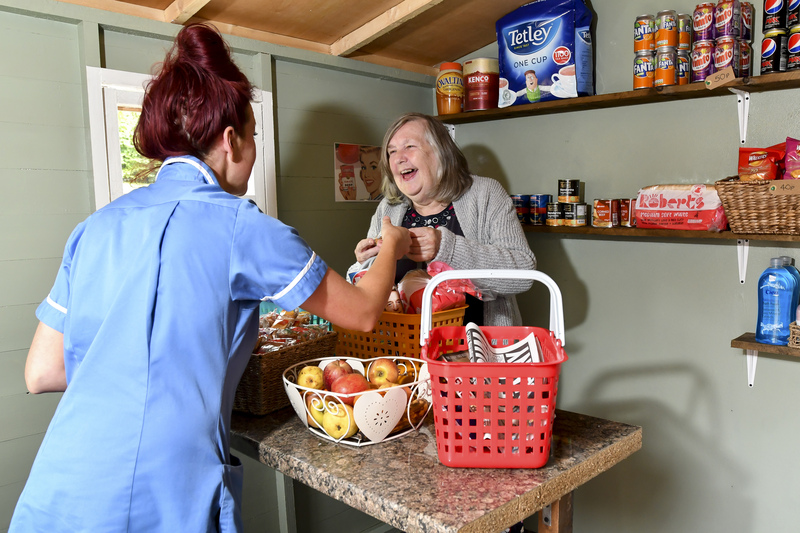 The summerhouse, converted into a working shop led by staff member Deborah Turley and Linzi Cartledge, will allow residents to buy items such as everyday essentials, newspapers and sweets and retain their independence in a safe environment. Some of the week it will be manned by volunteers including residents’ families but staff will be able to take residents into the new shop at any time of the day. Lightmoor View is a specialist dementia care home run by Coverage Care, Shropshire’s largest not for profit care provider, with up to 75 residents at any time. Michelle Yates, Quality and Performance Manager at Lightmoor, said: “The shop is a great way to help our residents carry on with a familiar task that they would have done prior to their dementia. It may seem like a simple thing but the process of buying a newspaper or a bar of chocolate will stimulate the brain and encourage residents to stay independent. This entry was posted in Company News and tagged care homes shropshire, coverage care homes for elderly, lightmoor view care home. Bookmark the permalink.